Near acacia woodland at lake Elementaita, Kenya. Dec. 2015. It is perched on an exotic, invasive plant, an American prickly pear cactus. This insectivorous bird is found in rocky areas with some trees, and sometimes near settlements. At 15 to 16 cm this is the smallest of the rock thrushes. The male has the head, throat and upper mantle blue-grey, the underparts orange-red, except for the blackish centre tail and tips which form an inverted T shape. The female is duller and paler. 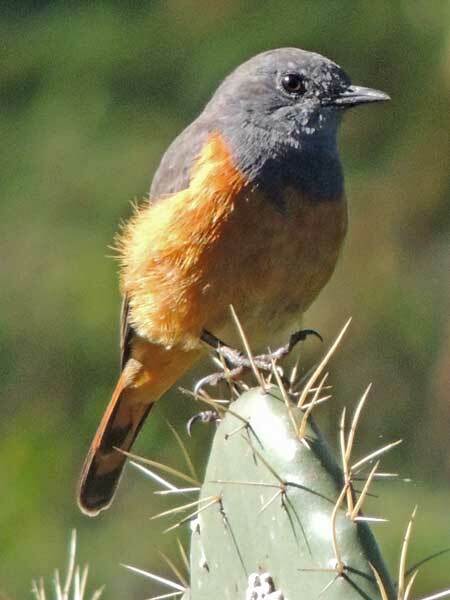 It is readily mistaken for a redstart because of its habit of trembling its tail. Copyright Michael J. Plagens, page created 28 March 2016.